We started by having a group discussion to reflect on how things have been since session one. Thoughts from the group included reflections on developing a social presence to a cognitive presence…how you develop socially as a group. Dependency on Moodle versus not utilising Moodle to its fullest, and the use of other technologies such as WeChat and Yammer to communicate with students. It was questioned as to whether you should go down the route of social media to communicate with students where I said how instant app communication (such as WeChat) doesn’t necessarily mean that you will get a response…even when you know they have read it! 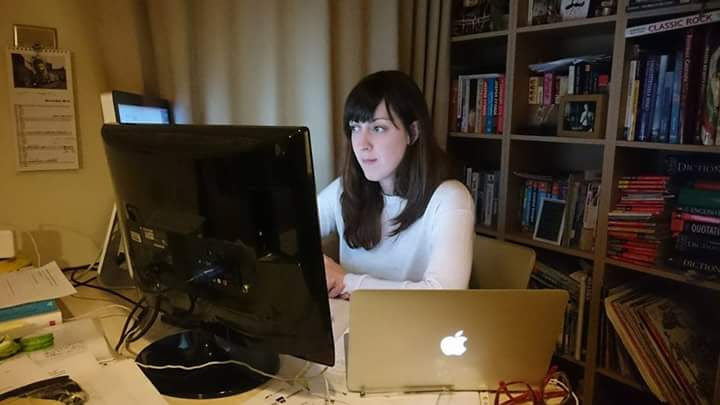 I have to share with you this photo manaXi took of me as I was working on TELT homework the night before (yes the night before, not best practice)…this is my triple-screened technological den at the moment…and I’m not very good at sitting still. Note all of manaXi’s maps in the background, neither of us are good at sitting still. Mark stated it was important to develop a contract of communication with students – how would you like to be contacted? Email? Social media? It’s not just about the mode but the content you share. I mentioned working in partnership with a new Student Academic Partner for the CCVA and the development of a student-led forum/platform where, through group student consultation, they will propose, guide and help to create a platform that they will take ownerships for. Ownership is key. So much communication is based on us as tutors as teachers. Having the ownership value to switch from yourself to them, potentially provides another way to communicate. It goes back to negotiating…what methods do you use? What are other methods? Involve and observe what the students are doing. Teaching teachers how to use the technology for them to go away and use it…being the first step in the process. Need first points of call for staff…landing page or information such as Moodle Basics? Challenge of working with postgraduate students who are from a range of different backgrounds and the difficulties that come with this – can follow-up sessions be organised such as drop-in surgeries? Open forum and social engagement with students – how appropriate or useful is a social media (closed) group? With already a large focus on technology for teaching, virtual environments used and only accessible in lab exercises (configure and testing) means there is limited flexibility – highlight problems with the module or the session? Is it reflection? More needs recapping? Demonstrate something that can be taken away? More media knowledge to help with technology? It was noted that each person has a different set of restrictions and parameters to their learning and teaching practice, the departments and institutions they are working in, and the student cohorts. What is your learning and teaching philosophy? – Do you have one? Can you write it down? What principles, values do you adhere to? 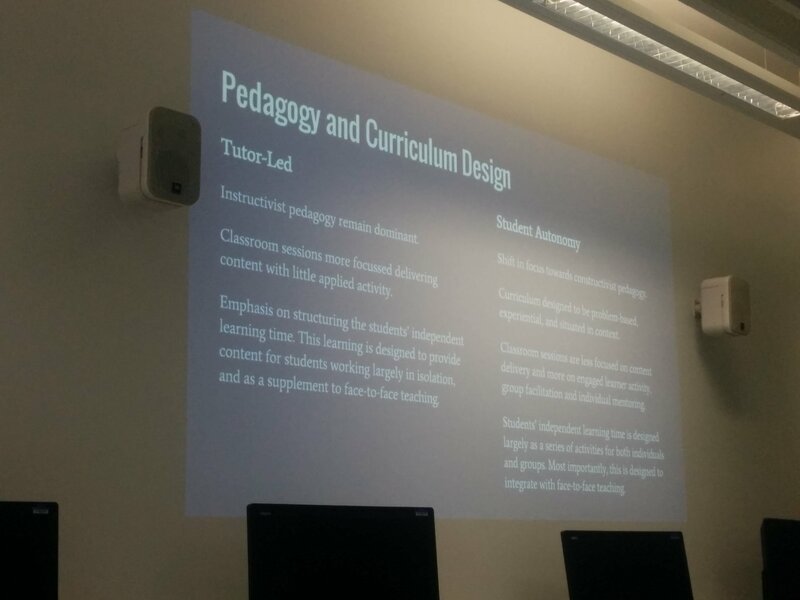 What pedagogies, approaches do apply to your practice? How does technology fit in with this? Here’s my very wordy first attempt! Do you practice your own philosophy? – Do you apply this to your teaching? Always, sometimes, never? Student Autonomy – students take ownership and develop their learning. Designed integration between face-to-face and independent study. Teaching is minimal but is the learning being applied? After a short biscuit break, we went on to talk about the BCU Ecosystem, starting with the visual mapping tool called ‘Popplet‘. These can be created online then shared and edited collaboratively, used on tablets and phones. Plagiarism is now called “originality checking”. 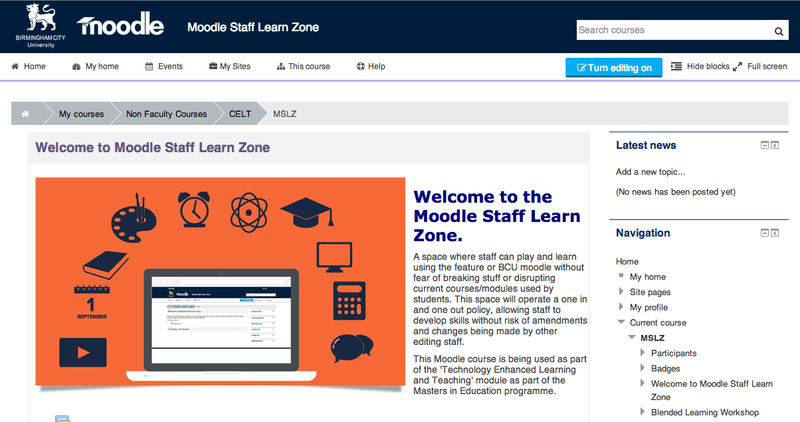 To experiment within the BCU Ecosystem, Mark set up a ‘Moodle Staff Learn Zone’ through Moodle so that we can all have a space to test, experiment and learn…to learn how to use activities for future learning and teaching…I AM SO OVERWHELMED RIGHT NOW with the possibility! We then moved on to question What is learning? 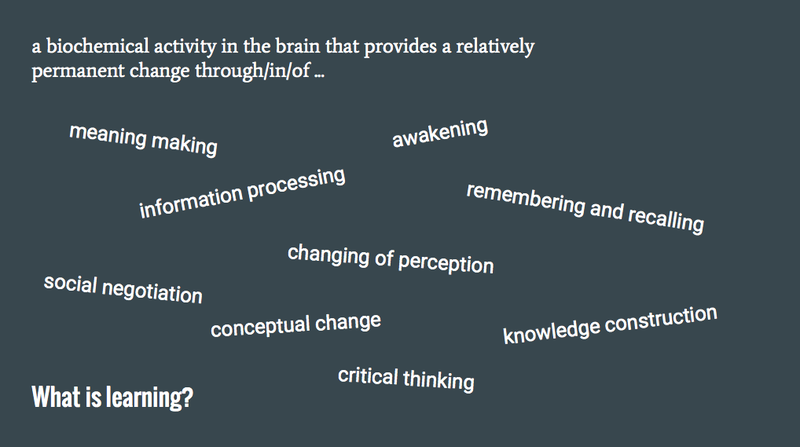 How do they compare to TELT’s 8 Principles for Activity Learning Design? Start summative assessment as early as possible – Assessment is the significant driver of student learning – it’s their currency! Resources should have associated learning activities connected to them – This avoids students being overwhelmed with resources that have no real purpose and reduce the likelihood of Moodle being used as a ‘Content Dump’. Looking for Deficits – Negative questioning, what’s wrong with it? How do we change it? What do we get rid of? – EXPERIENCES? Looking for Successes – Positive Question. What’s right with it? How do we build on it? What do we include? – EVIDENCE? Does the self-directed study motivate and enhance the learning? Does the technology used require prior skills and knowledge? To a higher level? Does it discriminate against technophobes? Are there any skills transferable to employment/real world? Are the peer-activities related to the sessions? Volume of pre-session work realistic and appropriate? Does it provide choice? Does it match up to your Teaching and Learning philosophy? Does it relate directly to summative assessment? Does it provide a variety of approaches? Is there an opportunity to capture progression? Is the activity predominantly student-led? Is the activity supported by appropriate resources? Can I add or change the activities I have stated? Can I add or remove parts? 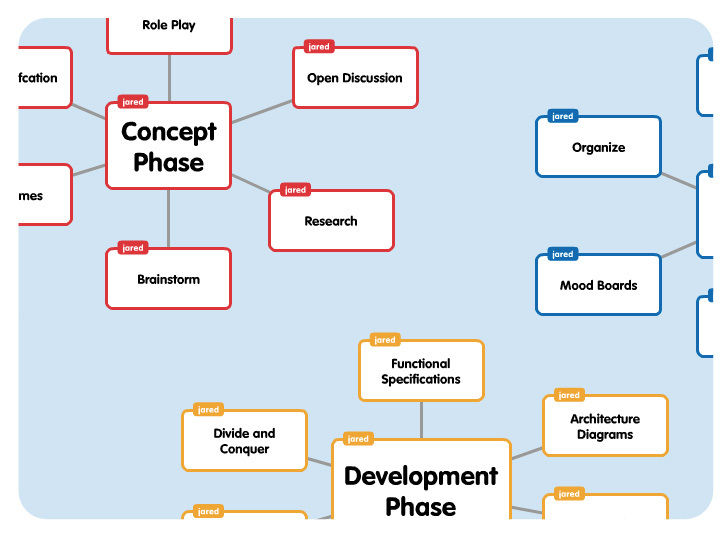 Are there enough different types of activities being implemented? Do you feel the arrows and lines help to understand how each part of the session link or does it provide confusion? After this group session, we had the opportunity to pick the brain of people from CELT at BCU whose current world (of research) is technology, education, learning and teaching with Kerry Gough, Beverly Cole, Nic Bartholomew, Dario Faniglione and Graham Lowe. I was particularly interested in gaining insight into technologies used for shared/connected international teaching…as I want to make this happen more and more through my own teaching. Q: Tips to engage groups in technology? A: Do you offer workshops to use the interface of Moodle? Take time within the curriculum…initially hand-hold them. What is the face-to-face time packed with? Can the flipped classroom model be used. 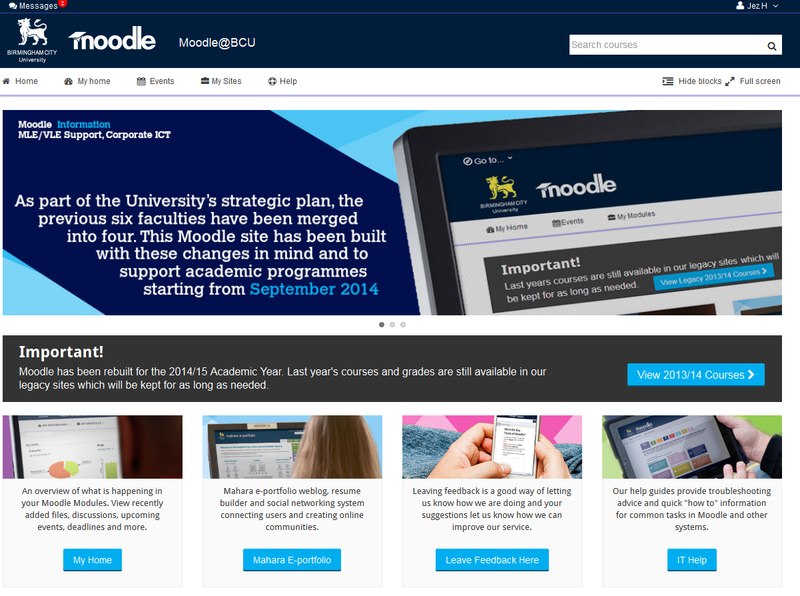 Use of Xoodle as a pre-induction space…it is a self-registering site. Use as a stepping-stone into Moodle. Building an initial community. Use former students/alumni to bring them back as mentors. Enables new students to get their solutions in different ways. Is it related to time to use technology? Or to fear of technology? Q: Success with flip learning. Can you talk us through an example of a flip? A: Film teaching had been traditionally lecture theatre with over 100 students, frustrated by the timings of the workshop…liked the hands on sessions. They wanted to spend more time in the classroom. I recorded the dry lecture component and put it into the digital environment (30 minute recorded lecture), which was their ticket to a session. The sessions then became 2-hour hands on workshops…there was a huge difference in the students where they were seen to remember content from the sessions. Benefit is that students can go back and watch the lecture whenever they want. To mark the student’s understanding of the pre-recorded lecture, an example, is every face-to-face session begins with an activity based on the pre-session task. Be consistent and stick by your principles. Q: How long did it take you to make that transformation? The NSS results I’ve looked at showed so many of the comments weren’t about the learning or content of learning, it was more customer service…both positive and negative comments. To me, it seems the change is hinged on someone like you (Kerry Gough), could it result in even worse NSS scores? A: A phased introduction with one lecture in one module – try before you buy – then it was requested by the students for the whole module, however it took a semester to plan and implement the pre-recorded lectures. The message we have is that if you want to try new things, you don’t have to do it all at once and ask your students what they think. There is a fundamental fear within academics…of stealing content, using other people’s content…read ‘Displaced by not replaced: the impact of e-learning on academic identities in higher education by Janet Hanson’. Without the academic it just becomes a YouTube channel…what we know from students is that they always want more time, they want more of YOU! One response from a student to the flipped classroom – “its like having one long 15 week tutorial”. When people throw themselves into it, it usually always works. We need to be much braver tell our students from the beginning, from the prospectus…tell them what we will be doing and what there experience will be. If we’re going to do something different, we are going to tackle the expectation before they come. We need to get better at evaluating and disseminating our practice. Q: I’d be interested to hear from your experience, a single example of something out of the blue, successful examples of practice…which technology paid off? Q: It sounds like the fundamental difference is one-to-one versus group…people being able to access the communal experience. A: That’s the point of the flipped classroom…do the thing on your own that you need to do on your own, then bring everyone together…the social constructivist approach, students don’t learn passively, they’ve got to actively construct it. Q: Are we just jumping on another bandwagon? How strong or robust is the flipped classroom? As a construct what does it really mean? A: Some things will stick, somethings won’t stick. We know in ten years time, the classroom will be completely different. Just make sure what sticks, sticks for you. What do we know? We know that it is assimilation and accommodation, and social constructivism…you go back to first principles. Some of it might be problems with terminology. I see it as an opening out of opportunities for learning and teaching. It gives you the flexibility to make choices. Flipped learning is saying choose the right tools for the right job. There are constraints but within those constraints there is a lot of freedom. Ask the students at the beginning what works for them. Mid-module evaluations are now taking place as students need a medical not a post-mortem. (A question from me) Q: I wondered if you had any good example of taking learning and teaching international through technology? A: Recorded simulcast lectures…watch the lecture live. 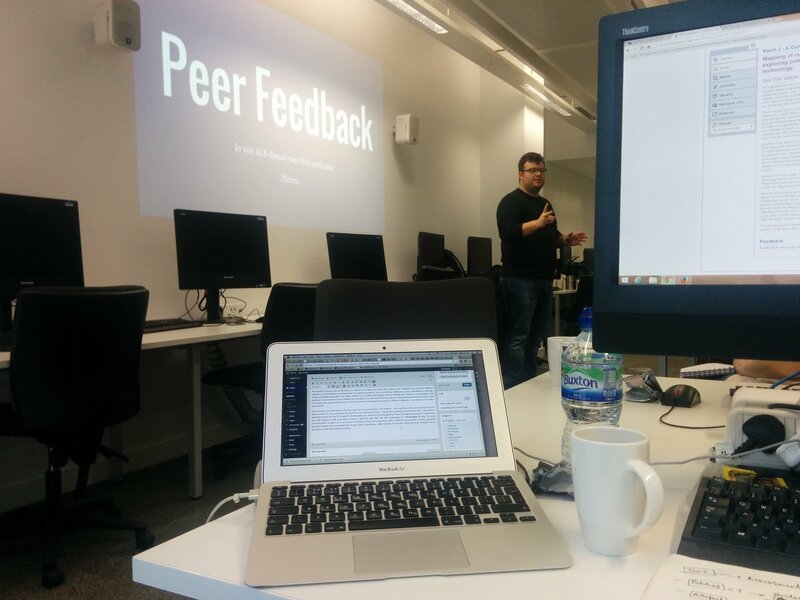 Not yet done at BCU, and Blue dot – virtual classroom, hosted service, tested with groups up to 20. There is also a screen sharing facility. Can also use as a lecture capture option. Q: Do you think peers learn better from each other through forums? A: I think they definitely learn better from talking to each other.